Kyoto has a lot to see. You need a few days in Kyoto to cover most of the MUST-SEEs. 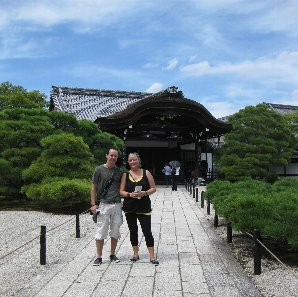 If this is your first visit to Kyoto, and if you have just one or two days in Kyoto, we sometimes give up visiting Arashiyama, because there is not enough time to do so. This time, they had four full days in Kyoto. So I chose one of the farthest places for their sightseeing. 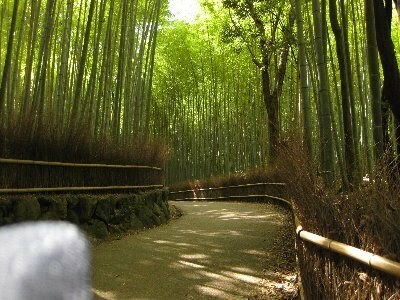 That was Arashiyama. However, we started our tour from Golden Pavillion and Ryoanji rock garden. And then, we visited Ninnnaji temple. These three temples have different atmosphere. You can enjoy the different types of gardens in a short time. As you know, Golden Pavillion is a circuit style garden. In this type of the gardens, you can see its beauty from every point of the garden. As you see, Ryoanji has a famous rock garden, the size of which is as large as a 25 meter swimming pool. This is a typical zen garden. The slight difference of the hight of its earthen wall surrounding the garden makes you feel the garden much larger. The sight of the garden from different points vary in each. Let's talk about the spirit of Zen there. Please feel Zen itself. Ninnaji temple is something more like Imperial style. Until the beginning of Meiji Era, a member of Imprial Family had become a monk of this temple. So this temple has Imperial air here and there. When you enter the building. you can see the white sand with a tree in either side, a mandarin orange on the left and a cherry tree on the right. It is an imperial style. These two kinds of trees are seen in fornt of the main hall, Shishinden, in Old Imeprial Palace in the same way. 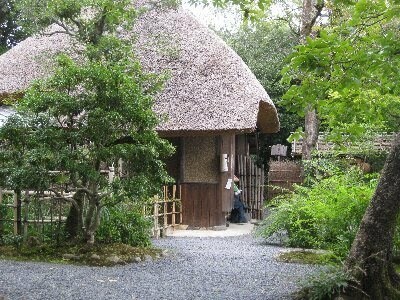 The building called Kondo is the one which was moved from Old Imperial Palace. It used to be used as Shishinden in the palace. In addition, you can see five story pagoda, too. You enjoy the garden, the pagoda and building at the same time. Actually, Ryoanji and Golden Pavillion are very famous, so many tourists come to these sites and always are crowded. However, in Ninnnaji, you can enjoy this temple without so many tourists. We headed for Arashiyama. This area is very popular among not only foreign tourists but the domestic tourists. 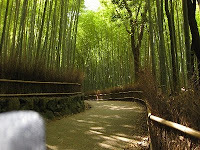 If you have enough time, walking from one place to the other through Bamboo forest is very enjoyable. We spent the morning visiting three temples in the northwestern area, and decided to spend the afternoon in Arashiyama. As we had seen three nice temples, we skipped Tenryuji temple and walked along Bamboo forest. Gioji doesn't have high religeous status. But still many people like this temple. 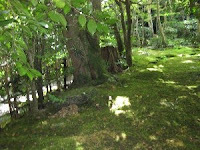 That's because it has specific atmosphere, calmness and green of moss. 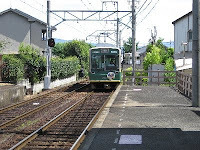 On the way back to Arashiyama station, we dropped in at Rakushisha. This is not a temple but the second house of Mukai Kyorai, the student of the great Poet, Matsuo Basho. We can see the old style of the house in the countryside in old days. Viewing it from across the field is very nice. You can imagine what it was like in the past. Rakushisha means the house with all the persimmons fallen. This is because all of 40 persimmons in this house had fallen down due to the typhoon after Kyorai made a promise to sell all of them. After walking along Hozu river bank, our tour ended there.